Unique, smooth, rich, full-bodied; no, my friends, it's not my dream cowboy, it's Laughing Cow Light with Blue cheese spread. It's made from a secret recipe and contains delicious, mouth-tickly blue cheese, combined with the delicate and creamy The Laughing Cow cheese. Add it to a cracker and you have a perfect snack for elevenses, or for that ‘tide-me-over- ‘til teatime moment' - all for 60 calories*. Or try smoothing a dash of blue cheese deliciousness onto your toast for your mid-afternoon munchies. The handy portion is perfect to help you keep tabs on just how much you're eating, and its protected by its own individual wrapper, so why not lob one in for your lunch on-the-go, along with a drink of water to keep you feeling hydrated? And for those of us keeping an eye on our calories, worry not; at 25 calories per triangle, its easy to keep a check on your calories . Of course, there are no added colours or preservatives, it's suitable for vegetarians and naturally, a source of calcium. 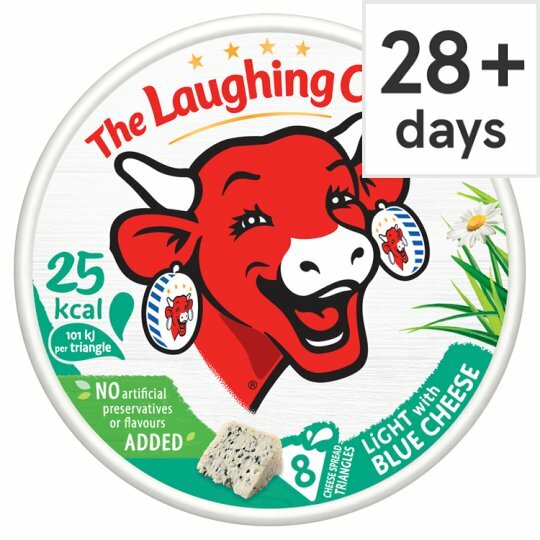 Pop a pack of The Laughing Cow Light with Blue cheese spread in your basket now.